I carried forward my experiment in which I painted on a crumpled ball of relatively light-weight paper (Abstract – After Simon Hantaï) to today’s effort to apply Hantaï’s method to a very heavy (246#) sheet of linen-textured paper. I scored the paper along its width, with about a dozen (more or less) parallel lines. After I folded the paper into a fan-like zigzag, I clamped both ends with C clamps and painted the edges. I used watery pigments, so I would get some leakage to the inner vertices of the folds. I chose Prussian blue and quinacridone nickel as my colors, since I like the way they interact. After unfurling the paper to its original 12″x9″ dimensions, I taped it to a board for one final procedure. I applied a loaded brush of Prussian blue horizontally, to the top half of the paper and quinacridone nickel to the lower half. The end result is the interplay between the many strong vertical greens and the paler, wider horizontal blue and yellow stripes. 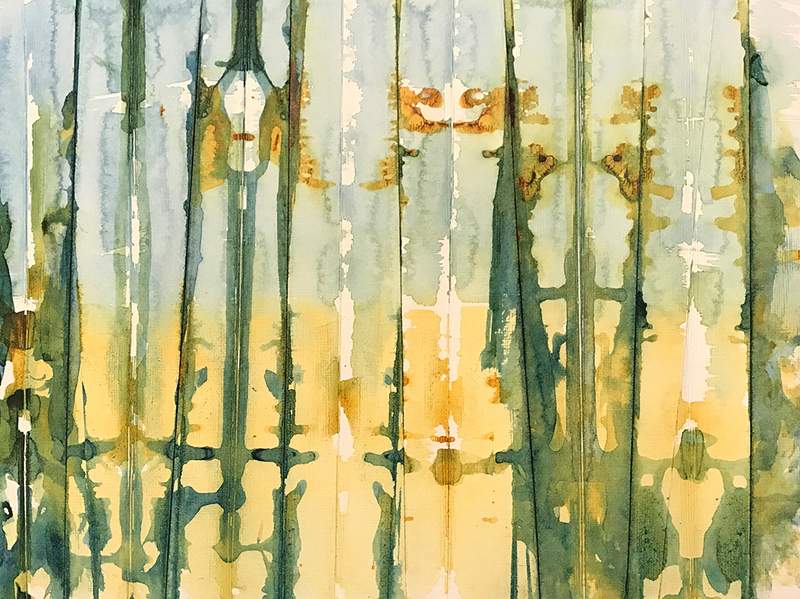 This entry was posted in Personal Stories and tagged abstract art, abstract expressionism, art, artistic process, creative process, folding, painting, Simon Hantai, visual arts, watercolor. Bookmark the permalink. Trees or a swamp. Vertically growing vegetable matter, at any rate. Thanks, K.
I love this. I feel like an insect in tall grass! Thanks Claudia. I like your take – a bug’s eye view!